Today Harlem Wizard visted BASCS High. Check it out here. 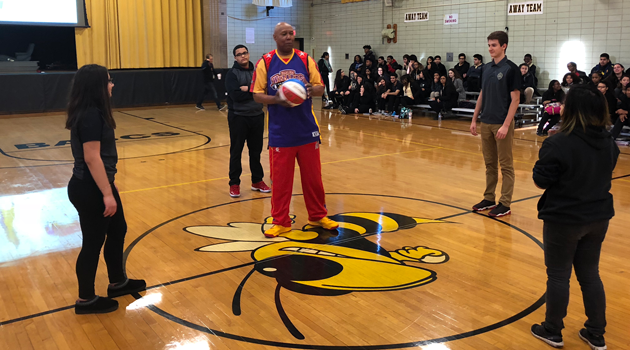 More details for the upcoming basketball event: The Harlem Wizards team vs. iLearn Schools basketball event slated on Tuesday, March 13, 2018 at Bergen Community College in Paramus, NJ is an event that combines aspects of big time productions with hometown community flair. Basketball aficionados are treated to great skills, teamwork, slick dribbling, alley-oops and crazy slams. The non-hoop fans attending will find out that this is much more than just a basketball game. The event is funny, theatrical, exciting and spectacular and the gym will reverberate with laughter, enthusiasm, and much more. We expect this event to have over 800 people in attendance that includes players, students, parents, schools’ staff. For more information about the Harlem Wizards, please visit Harlemwizards.com. For the map of the college, please go to this link.